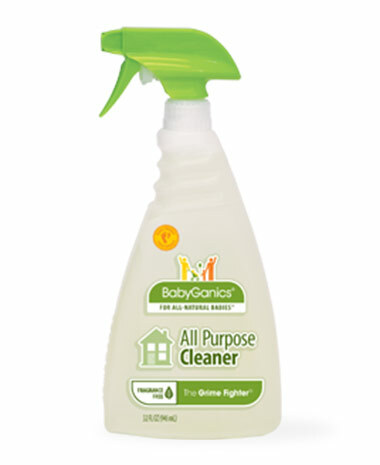 I was recently contacted about reviewing BabyGanics all purpose cleaner! "We're Kevin and Keith, founding fathers of BabyGanics. As family guys, (wife, kids, & pets!) we really do get how hard it is for parents to make the daily, balanced choices that go into creating a safe healthy and happy environment for their babies. We dedicate our days to helping you do just that. 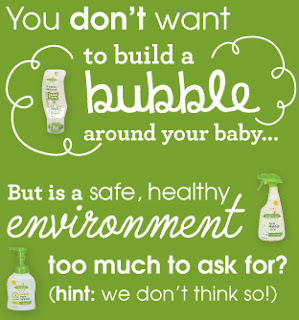 Our products are designed for babies but, honestly, they're just as much for parents; whether they protect, moisturize, nourish or clean, their most important ingredient is always peace of mind." 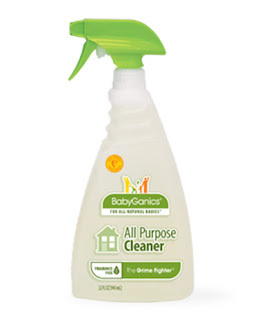 I am always looking for a better and safer way to clean our house and BabyGanics was perfect! I'll admit I wasn't quite sure if this cleaner would meet my standards of clean, but IT DID! I first tried it in our kitchen the place that seems like I'm always cleaning, my first try was sticky laffy taffy that was left on my counter by my oldest daughter, in the back of my head I was thinking there is no way this will work, but I was pleasantly proved wrong, one spray and one wipe with my rag the dreaded laffy taffy was gone! I've also discovered that this is the best product by far that I've used to clean our wood dining table, it gets all the grimy junk off with little effort and safe for my table! I have 3 young children and 2 dogs that I have to worry about keeping safe and with this product I have no worries, it's 100% safe for everyone running around my house!